This paper, "Low frequency magnetic emissions and resulting induced voltages in a pacemaker by iPod portable music players," will be published in open access journal BioMedical Engineering OnLine. It's based on a study by Howard Bassen, a researcher with the FDA, who led a research team who measured the magnetic fields produced by four different iPod models: a fourth-generation iPod and an iPod with video, and an iPod nano and iPod shuffle. They produced data refuting claims that the iPod interferes with cardiac pacemakers. This was the claim from the authors of a highly publicized study from last year, "Pacemaker interference with an iPod," who concluded that "Warning labels may be needed to avoid close contact between pacemakers and iPods." They had analyzed the effect of placing the pacemaker programming head and an iPod adjacent a single patient's implanted pacemaker. This study was done because the patient had fainted which resulted in a fall and head injury and prompted the examination of suspected electromagnetic interference (EMI) by an iPod. 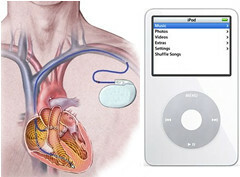 To test this, they placed an iPod (model not specified) 2 inches above the pacemaker programming head which was placed adjacent to the patient's implanted pacemaker (supposedly on the skin of the chest wall, but the position was not specified). With this setup, they observed two types of interference in the form of oversensing by the pacemaker. What Bassen did was to first measure the magnitude and spatial distribution of magnetic fields generated near the surface of each of the four iPods using two types of sensors. The peak magnetic field strength was 0.2 millionths of a Tesla, which is about 100x lower than the levels which could interfere with a pacemaker. Finally, he tested the interference with the pacemaker directly by putting the pacemaker case and leads in a saline filled torso simulator built to ANSI specs for the pacemaker electromagnetic compatibility standard. This was his "instrumented can." This simulated a pacemaker implanted in a patients chest. In this way, they estimated the voltages these fields might produce within the protective "can" of a pacemaker. The different iPods were place on top, to check interference via magnetic induction. He concluded that "all iPods we studied emit very weak fields." This meets the EMC standards for active cardiac implants which require that these devices be immune to very high intensity magnetic strengths. "Based on these data, it is again concluded that it is not possible for interference to be induced in a pacemaker by the music players we tested." R. Carrillo and R. Stevenson, “iPods and Pacemakers: No Clinically Significant Electromagnetic Interference”, Abstract for Heart Rhythm Society 2008 Meeting (submitted). ANSI/AAMI PC69:2000, “Active implantable medical devices- Electromagnetic compatibility- EMC test protocols for implantable cardiac pacemakers and implantable cardioverter defibrillators”, American National Standards Institute, 2000.
 International Organization for Standardization (ISO), “ISO 14708- 1:2000(E), Implants for surgery - Active implantable medical devices - Part 1: General requirements for safety, marking and for information to be provided by the manufacturer”, Geneva, Switzerland, 2000.